Iraqi special forces arrived to liberate the village of Tob Zawa from Islamic State on Tuesday. As Iraqi forces traded fire this week with the Islamic State fighters who held his village hostage for the last 2½ years, Taqayadin Hawas hunkered down with his seven children and prayed not to die. Mortar shells nearly leveled the house as his children wailed. With snipers outside, the family couldn't flee. He thought their home would be their grave. When the gunfire stopped Tuesday, the family emerged to find their house and much of their village of 75 homes destroyed. One elderly man had been killed by a mortar strike. Still, the 700 villagers were jubilant. Free of the militant group's stern Islamic strictures, men cut their beards, women removed their veils. Families prepared for reunions with family they had not seen in years. But freedom brought new problems.The villagers found themselves treated with suspicion, held under guard, searched and questioned even before arriving at the residential camps for Iraqis displaced by the war — were they innocent civilians, or militants in disguise? Telling the difference between the two is one of the biggest challenges faced by local authorities and international aid groups. "We don't want to see people looking for safety punished," said Alex Milutinovic, International Red Cross country director in Iraq. "The screening process, that's what it's for: So that people who committed crimes will be punished…. The rest should be provided assistance and support. The majority of [displaced people] are not terrorists." Frederic Cussigh, head of the United Nations refugee program in the northern Iraqi town of Irbil, said his organization arranged to fast-track screening for women and children, but that the rest must be screened carefully because Islamic State "could infiltrate with the civilians either to hide or perpetrate some attacks later on." At a checkpoint near Bartella, about 15 miles east of Mosul, hundreds freed from the village of Tob Zawa were quickly placed under guard and families were told they would be separated. Women and small children were ushered ahead, men and older boys held back for a couple of hours as Kurdish soldiers questioned them and searched their cars, trucks and tractors, some hauling a mix of people, furniture, sheep and calves. It was difficult to discern which villagers – if any – had supported Islamic State. Anter Arafat, 64, said soldiers questioned him about life under the militant group's occupation; they wanted to know who had supported the militants. Arafat told them the fighters had all fled. He and others spoke of being forced to pray five times a day, to grow beards and abide by strict rules that forbade television, cellphones and smoking. Those who missed prayers lost their electricity. Women had to cover nearly every inch of their bodies, including their hands. Even men said they had to ensure their ankles were covered. They said their children had not seen doctors or attended school. Kurdish and Iraqi soldiers guarding the convoy of evacuees were edgy at first. They warned those approaching the villagers that some might be armed with suicide vests. Azzat Shaheen, a portly, gray-bearded shepherd in a white traditional gown, was being examined by soldiers before being shuttled to a camp for the displaced. Shaheen, 55, said he didn't support Islamic State. He tore up receipts for taxes he had paid to Islamic State officials, scattering them in the street. But Shaheen's politics, as is often the case in divided Iraq, are complicated. He is part of Iraq's Sunni Muslim minority, as are the Islamic State militants, and Iraq's government is now dominated by Shiite Muslims. 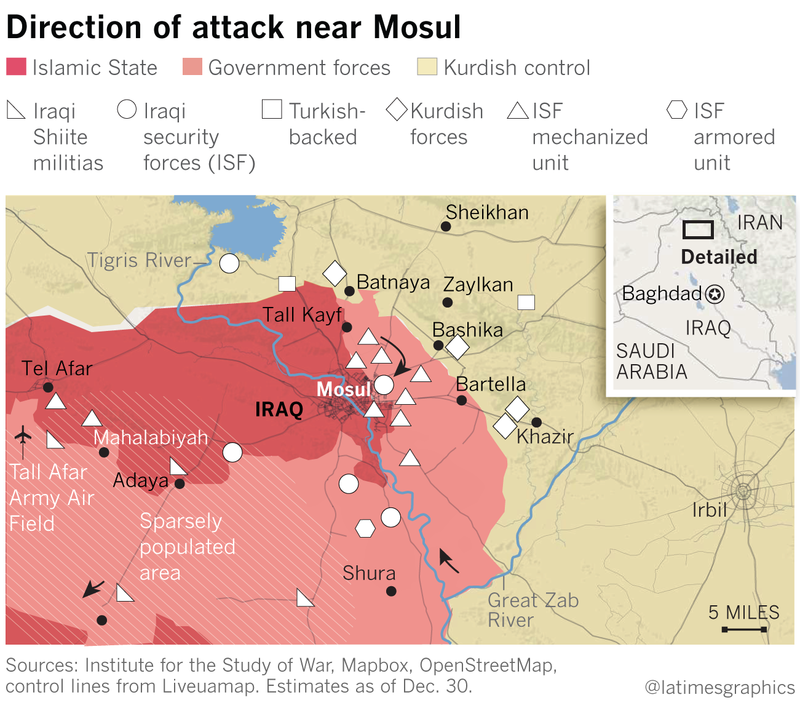 He said he wanted the area around Mosul to maintain its Sunni majority. Some of his relatives in Mosul, he said, would "be fine [living] under Islamic State." Shaheen said he suspected that a Shiite neighbor reported him to the incoming soldiers, and now the troops wanted to know everything about him. "Now I'm a suspicious guy," Shaheen said as Kurdish soldiers popped open his trunk and poked around in his pink suitcase. "I feel insulted," he said. "I have no relation with Islamic State and I didn't hurt a single man." In his back seat, soldiers found a metal ammunition case. That's from the Iraqi army, Shaheen explained, frowning. He'd salvaged it as he fled. "Do you have a gun?" they asked. "I had a Kalashnikov, but the Iraqi army took it," Shaheen said. Nearby, Abdel Hadi sat cutting his beard with scissors and a green plastic mirror, hoping that would persuade officials at the camp that he is not allied with Islamic State. "I'm expecting an investigation. I don't know what," said Hadi, 33, who like the others had been separated from his wife and children. Also cutting his beard was Omar Madhar, 35, whose wife and four children had already been taken to a camp. As he trimmed, a friend who had driven 45 miles west from Irbil sneaked up behind him and placed both hands over his eyes. The men laughed. It was the first time they had seen each other in 2½ years. "I don't care what happens to us" at the camp, Madhar said. "Nothing can be as bad as what Islamic State did." Behind the wheel of a nearby flatbed truck full of women and children eating pomegranates, Maher Abdel Kareem was also hopeful. Kareem, 30, wearing a short beard and a blue soccer jersey, had managed to get his family to safety, including his wife and 2-week-old son. "I feel like I was dead," he said before the convoy departed at sunset, "and now I am alive again."